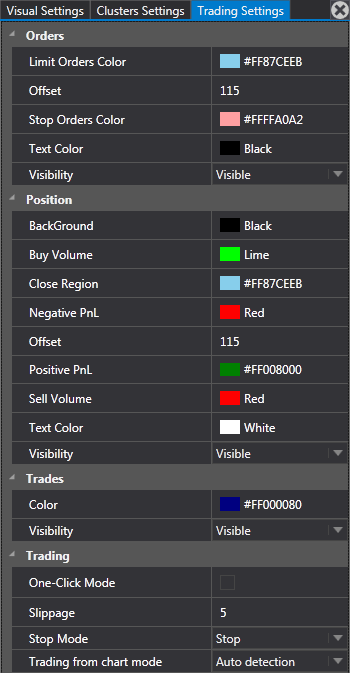 To open the settings, click on the icon on the chart menu bar, which will open a panel of visual settings on the left; select the third tab (“Trading Settings”). Offset- indent setting order of the price scale. Offset - indent setting position of the price scale. Color - Color display setting transactions in the chart. Also, hovering the mouse over the "arrow" of a transaction on the chart will show the details of this transaction. One-Click Mode - when this option is enabled, the order will be sent by means of a single click without requiring the confirmation of the trade. In order to ensure the triggering of orders regardless of the slip, select the Stop mode. If the Stop Limit mode is set and a little slippage occurs, the orders will not be triggered. Auto detection - this option allows using right clicks and left clicks to set limit and stop orders for asks and bids. A left-click sets the limit order; a right-click sets the stop order. The order direction is determined automatically based on the location of the mouse cursor (above or below the price). 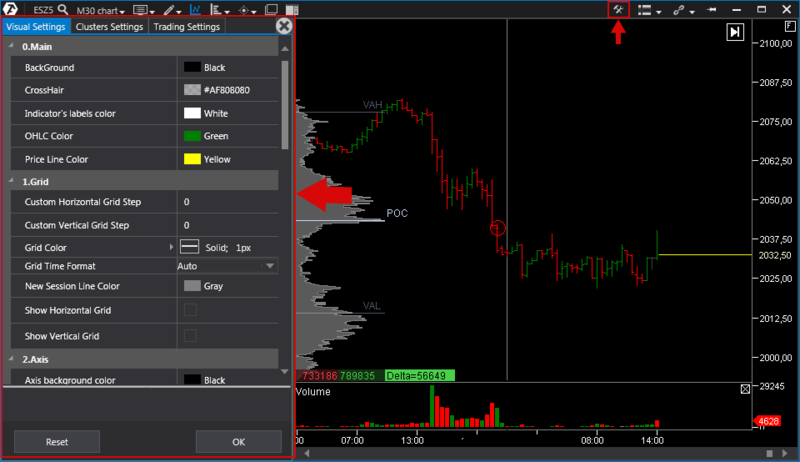 Lclick:buy Rclick:sell - this option is convenient when entering a position in order to avoid opening the position in the opposite direction. If the mouse cursor position changes relative to the current price, the type of order execution will change from Limit to Stop (or from Stop to Limit). Left Mouse Button - Buy: if the cursor is below the price, the Limit is set; if it is above the price, the Stop is set. Right Mouse Button - Sell: if the cursor is above the price, the Limit is set; if it is below the price, the Stop is set. *To reset the settings, press Reset. To save the settings, click ОК (at Visual Settings tab).